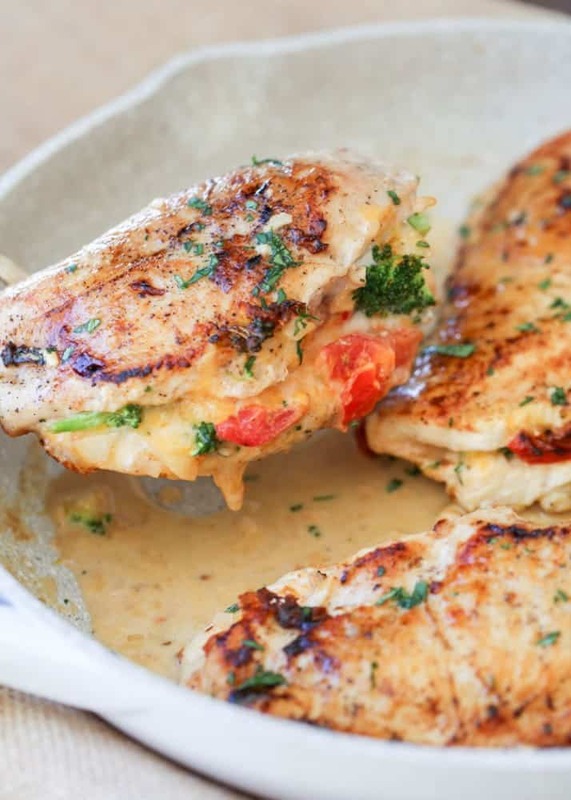 Be prepared to be AMAZED by this Broccoli Cheese Stuffed Chicken Breast Recipe with tomatoes and smothered in an easy garlic wine sauce. The stuffed chicken is seared in a skillet then added to a wine sauce and baked. The chicken breast becomes so flavorful, juicy and oh so tender. Serve chicken with mashed potatoes! Lightly beat the center of chicken breast so it’s even in thickness. If using raw broccoli be sure to chop the florets into small parts so they cook evenly. Freshly grated cheese performs much better in recipes as it lacks extra additives pre-shredded cheese has. For the wine sauce, if you don’t mind the onions in your wine sauce, chop them really fine and you will not need to remove them as the recipe indicates. You can use your favorite cheese for this recipe. I used Colby jack in the recipe but mozzarella, provolone or mild cheddar may be used. When cutting a pocket in the chicken, be careful not to cut all the way through so when you stuff the chicken, the ingredients won’t fall out and cheese won’t ooze out. Lightly secure openings of chicken breast with toothpicks so the stuffing stays secured. Just don’t forget to remove the toothpicks once seared. It’ll be more difficult to remove them once the wine sauce is added. I really enjoy recipes where you take chicken breast and stuff it with different ingredients. Other than this stuffed chicken I am sharing today, I love the Mushroom Stuffed Chicken in Alfredo Sauce I already have posted. It’s a phenomenal recipe that I think you need to try. This is a great recipe to prepare in advance. Prepare the chicken breast per instructions, cover and refrigerate. Continue with the recipe right before dinner needs to be served. what kind of wine can I use? You want to use a dry wine. Sauvignon Blanc, Pinot Grigio, Pinot Blanc or Chardonnay are all great choices (I used Chardonnay in this recipe). You don’t have to purchase an expensive bottle for cooking. Mine was like $7.00 and it works great! Mushroom Stuffed Chicken in Alfredo Sauce– For the mushroom lovers. Chicken Parmesan Recipe– Classic restaurant dish for a fraction of the price. 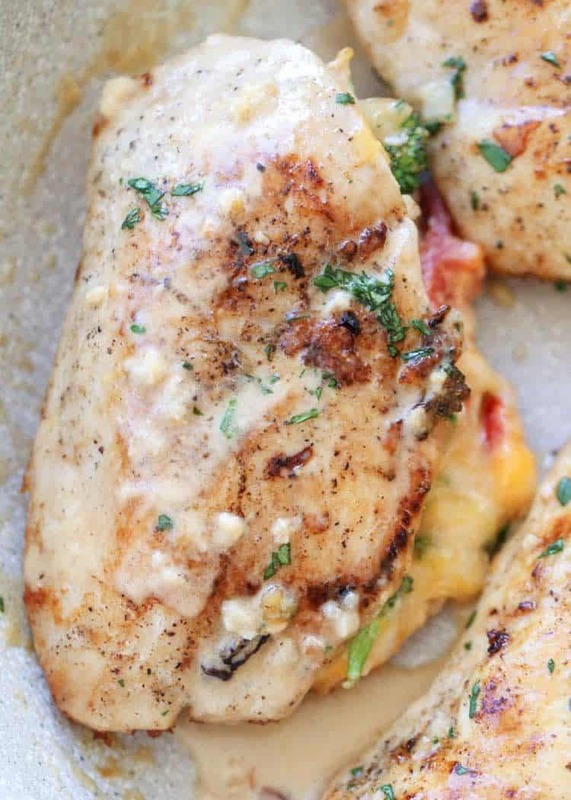 Ham Cheese Stuffed Chicken Breast in Sauce– The homemade sauce is the best. 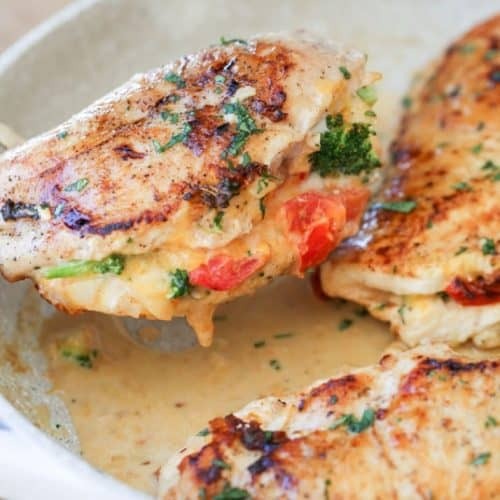 Tomato and broccoli cheese Stuffed Chicken Breast Recipe smothered in an easy garlic wine sauce. Perfect easy dinner served with mashed potatoes. Preheat oven to 365°F at step 8. Cut broccoli into small florets. Chop tomatoes. Grate cheese. Slice onion. Mince garlic. Lightly beat center of the chicken. Cut chicken breast to create a pocket. Season chicken with salt and pepper. In a bowl, combine broccoli, cheese, tomatoes, 1 minced garlic clove and lightly season with salt and pepper. Stuff chicken breast with the broccoli filling and secure with toothpicks. Heat oil in a large skillet, once hot, and add chicken. Sear chicken 3-5 minutes per side, until chicken is golden brown. 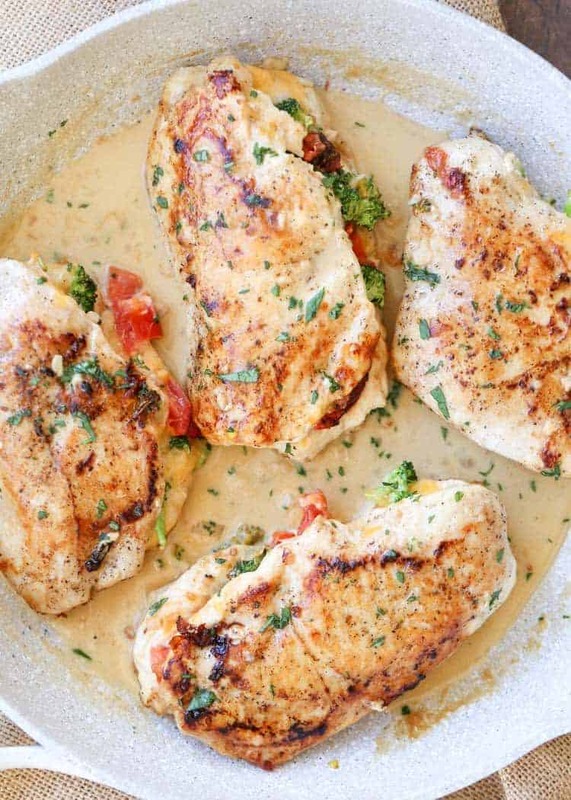 Remove the chicken breasts from the skillet. Add butter and sliced onion to the skillet. Sauté over medium heat until onion starts to become tender. Remove the onion from skillet and add to a sieve. Add garlic to the leftover butter and sauté 1 minute, add flour to butter and mix vigorously. Pour the chicken broth through the sieve over onions into the skillet. Discard of the onions. Add wine to the skillet and bring to a light boil. Add heavy whipping cream, lightly salt and pepper to taste. Let the sauce simmer 2 minutes. Add the chicken back to the skillet pour sauce over chicken. Cover skillet with foil. Bake 15-20 minute, until the internal temperature of the chicken reaches 165°F. Peggy, I’m excited for you to try them as well. To be honest, wine was never a thing for me as well (we don’t drink wine). But once I learn to cook with it, I love all kinds of dishes with wine. I added a list of different wines you can use. If you go to the store, ask someone to help you find a good cooking wine. Then, just follow the instructions. After you purchase your wine and try this recipe, you MUST try THIS ONE as well, it used wine. Am I missing something, as I don’t the baking temp in this recipe? One of the fun things that you can do is close The pocket on any type of meat is instead of using a toothpick use a piece of spaghetti. That’s a great tip, Suzy. Thanks so much for sharing. And, thank you for visiting our online home:) <3. Thanks for another delicious recipe! Just an idea… your website is great but it lacks a search bar. I really wish that there was a way to search for recipes using key words. For example, I had some chicken breasts that I wanted to use up, but I had to look through a whole bunch of recipes before finding this one. 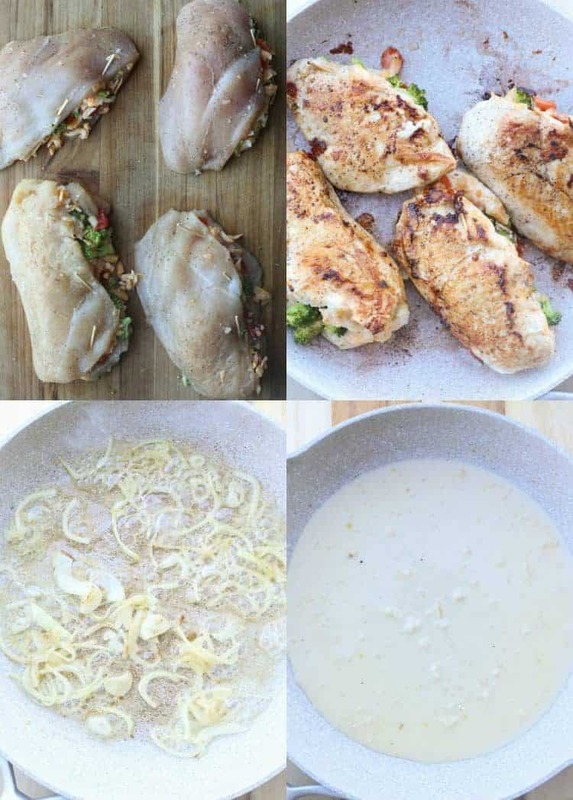 It’d be so much easier to just search for “chicken breasts” and see all of the recipes for it with a few clicks. We are currently working on a complete site redesign that will launch in the summer. I. AM. EXCITED! That is one of the fixes that will take place. I currently have one at the top if on a desktop but on the mobile version, it’s all the way at the bottom, bummed. We will get it fixed. 🙂 Thanks so much for sharing your input, those are always so helpful. Do you think this would work with boneless skinless chicken thighs? Looks delicious!!! Would love to make it but I never cooked with wine before. What type/name of white wine you used for this recipe? We do not drink so it was very hard to learn to love to cook with wine, I was so nervous. I love what wine does to food and probably cook with wine once a week. It’s amazing! You can purchase any dry wine. My personal favorite for cooking is Chardonnay (Sauvignon Blanc or Pinot Grigio is also great, a bit more expensive). I’d love to hear feedback, Mila! 🙂 Enjoy.